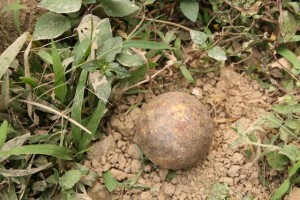 A cluster bomblet called the BLU 24. Sometimes children in Laos mistake bomblets for fruit or toys. A mother in Nondaengneua village, Soukhouma district, Champasak province, in southern Laos, is still mourning her daughter’s death after she was killed by UXO in February last year. She was 13 years old, she should not have died and been taken from her family, the girl’s mother, Ms Jone lamented. Her son survived the blast, but was injured. When the device exploded, it killed or maimed seven children, including Ms Jone’s two children. The explosion shattered a quiet evening when two groups of children were returning home after playing and tending to their buffalo in nearby fields. They spent all day with the animals in fields the villagers called Thong Lieng Khuay, meaning “buffalo raising field”. At about 4 pm the children were walking the buffalo home and were nearing the village when they saw two friends playing with a cluster sub-munition, locally known as a “bombie”, tossing it up in the air. The others joined in the play, except for two who were afraid and ran away. One later rejoined the group as they continued to play with the deadly device. A few minutes later the “toy” exploded, killing five children instantly and seriously injuring the other two. “My daughter was killed because of this, and I often cry when I think of her,” Ms Jone said as tears ran down her face. She has also paid 700,000 kip [US $87] of her own money. According to the National Regulatory Authority for UXO/Mine Sectors in Laos, Ms Jone will be given about 3,500,000 kip in compensation. It is estimated that out of the 2 million [metric] tons of bombs, including 288 million cluster bombs, that were dropped on Laos between 1964 and 1973 during the Indochina War, about 30 percent did not detonate. During this time, a total of 580,000 deadly bomb missions were conducted by US airforces, equivalent to one bombing mission every eight minutes for nine years. Jim – thanks for your continued work and greetings from Turkmenistan. Keep me on all your lists.